This toothpaste is the best toothpaste I have used. Not only is the texture perfect, it rinses cleanly and does not leave any residue. Also, I have not had any sensitivity or a canker sore since using it. New lifetime brand!!! I love the way this toothpaste tastes and rinses so cleanly. More importantly, I have not had any mouth sores or sensitivity since I began using the product 8 months ago. Recently tried this product and found it to be a great alternative to Sensodyne, Colgate, and Crest. The paste is bright white and smooth. It has a nice taste that isn't overpowering. This toothpaste is great and has dramatically improved the dental health of a family member. I have had gum surgery and sensitive teeth. AloeSense has been a wonderful product that has been gentle and soothing on my teeth and gums while at the same time it leaves my teeth feeling clean and fresh, with no abrasion on my gums. Highly recommend!! I've been using AloeSense for a long time and like it a lot. Having it available at Walgreens makes it easier to get. Gentle on gums and has a great taste. I feel as though my teeth really get a good cleaning with this product. This reviewer is employed by Walgreens.com or its affiliate and may receive free product in exchange for providing his/her opinion on products sold on the Walgreens.com™ webpage. Although this reviewer maintains an endorser/advertiser relationship with Walgreens.com, this review represents his/her honest opinions, findings, and/or experiences. This a good toothpaste and the service could not be better, fast and easy. Have been buying these for a couple years now. Soft bristles are gentle on my gum tissue and actually clean very good between teeth similar to flossing. I brush thorough and long so the bristles get a little out of shape within a month or so. Price is good on these so I don't mind if I use more brushes than usual. I order a dozen at a time and change out every month. This tooth brush is very soft on my sensitive teeth and gums. It has bristles of different lengths and quantities, so it feels like almost flossing in some areas while I am brushing. I tend to brush too hard sometimes, and the bristles have not started to bend over yet which is good. I have used many different toothbrushes over the years and for my sensitive teeth and gums this one is perfect for me. Nice soft bristles. The handle is a slim ergonomic design.. Have been using this brand for awhile now and they are comparatively long lasting. 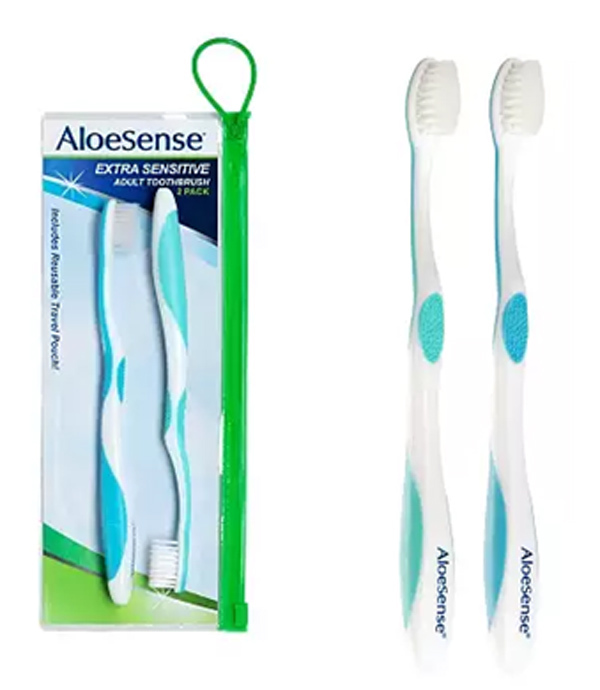 I've been using the Aloesense toothpaste for several years now due to sensitive mouth issues so thought I'd try their toothbrush, oh my, they're great! So soft yet very dense in the amount of bristles! Has the right angle in your hand, TRY YOU WILL LOVE! Bristles are silky soft. They clean teeth, gums, roof of mouth, and tongue as well as any other brush. Handle is ergonomic and easy enough for anyone to use. I would purchase again and recommend to others. Very soft and gentle on teeth and gums. I'm prone to bleeding gums from hard bristles and it cleans well without harm to my gums. Much softer than your average toothbrush. Great for sensitive gums/teeth. It's the only kind of toothbrush my husband will use. I've been looking for exactly this kind of toothbrush. They are soft. Contact our team if you have any questions about our customer testimonials or about our toothpaste for sensitive mouths. We are based in Chicago, Illinois, and proudly serve customers nationwide.